﻿Blurred Magazine: Issue 3 – THE QUEEN'S CLOSET BY G.
So Blurred Magazine Issue 3 is finally out and I couldn’t be any happier! Each Issue is so improved, raising the bar and I feel honored and proud being a member of a dedicated and hard-working team. In this Issue, you will find a variation of things to see and read and at the same time you will see 4 different parts I was involved in. I was lucky to work with some of the biggest names in Cyprus and in fact, we worked together for this stunning cover and for the first editorial of the magazine, which you can find at Blurred Magazine’s page. Styling by me & Konstantinos Mavropetros . However, today I will share with you, ‘The Queen’s Closet by G’ article that was once more present in the magazine. This time, I decided to name the article ‘Pink is the New Black’ as Pink is one of the colours that are trending this season and all the designers have decided to follow the trend. I am delighted because I have worked with the best of the best, 4 designers that are exquisite, magnificent and innovative; Ramon Filip, Constantinos Vasiliades, G.Englezos and Roddiva Couture. And the results were beyond expectations. I want to thank once more everyone that has worked with me and did their very best to bring the best outcome. Paris Savva for the photos. Hair by Rinnovo Hair Salon. Right when we believed that Pink was an all time classic and already ubiquitous in the Fashion World, this season Pink is everywhere. From New York, to London, Milan and Paris, it is an ongoing trend among all designers. After all those androgynous looks lately, Spring has come and brought along some ultra feminine vibes with a new take on unabashedly feminine clothes, which are comfortable, flowy, a bit of vintage and of course cool. And of course, Spring Summer 2017 is all about PINK! A soft and gentle colour, that is often accompanied by ruffles, bows, light fabrics, and many more other romantic twists that add to the overdose of femininity. Pink is every season more or less in, however this season Pink has become the new Black, with every designer investing on it. Some might keep it ultra romantic and dreamy by obtaining pastel shades such as Baby Pink and Powder Pink, while others have decided to make a bolder statement with Shocking Pink and Fuchsia. Nevertheless, the fact here is that Spring comes with Pink so girls rejoice because this season is going to be bundle up in your favourite colour. This time, I decided to go all the way around Cyprus in search for the best Pink garments which I found in the looks of Ramona Filip, Constantinos Vasiliades, Roddiva Couture and G.Englezos. Four different designers, yet so innovative and full of imagination and creativity, who produced four entirely different pieces in Pink; others in pastels and others in bright pops. It is pretty amazing how with just one colour, you can have such a variation with unique and different looks; from romantic, to ethnic, to androgynous, to more vintage. Thank you so much for working with me and being so dedicated, I have to say that I really enjoyed working with all of you and hoping in doing it again. Admire their pieces of art Fashionistas and adopt the trend because everything is possible with sunshine and a little Pink. The ultimate Queen of Instagram and amazing designer Ramona Filip has done it again, with a magnificent capsule collection with strong ethnic and folklore vibes. I just love all the details on this dress, from the Shocking Pink colour, to the excellent cotton-silk fabric, to the small silver mirrors, the thin green patterns in between them, as well as the shape of it. A simple square neck with very thin suspenders while below the waist it falls further away from the body making it suitable for various body types, enhancing feminine silhouettes. A dress that can be worn from day to night; it is guaranteed wherever you are you will always be stylish while making a statement. I just admire how Constantinos always finds a way to keep most of his garments monochromatic, yet somehow they have a different story to say. He might design 10 pieces in the exact same colour, and each one will look and fit differently and this can only occur when someone knows how to manipulate a fabric by using his creativity. This season he inserted lace and created an ultra romantic look by designing a high-waisted jumpsuit in Pink lace and off-the-shoulders. He always adds a twist and the twist this time is the contrasting idea of wearing a jumpsuit which is a quite androgynous idea, in total lace, Pink, and off-the-shoulders; 3 entirely feminine elements. Constantinos studied in Milan, and from 2012 onwards, you can find his outstanding designs in Nicosia, Iphigeneias 62. His Spring Summer 2017 collection is majorly influenced by Marine style always keeping his signature with our favourite drapes and maxi flowy dresses and gowns. Follow him on Facebook as Constantinos Vasiliades and Instagram as conbyconstantinos as and fall in love like I did, with his new designs. 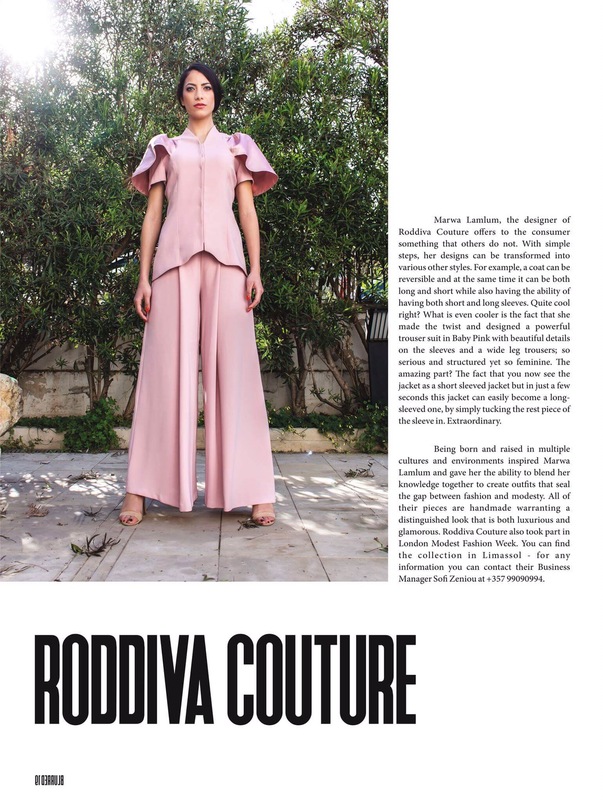 Marwa Lamlum, the designer of Roddiva Couture offers to the consumer something that others do not. With simple steps, her designs can be transformed into various other styles. For example, a coat can be reversible and at the same time it can be both long and short while also having the ability of having both short and long sleeves. Quite cool right? What is even cooler is the fact that she made the twist and designed a powerful trouser suit in Baby Pink with beautiful details on the sleeves and a wide leg trousers; so serious and structured yet so feminine. The amazing part? The fact that you now see the jacket as a short sleeved jacket but in just a few seconds this jacket can easily become a long-sleeved one, by simply tucking the rest piece of the sleeve in. Extraordinary. Being born and raised in multiple cultures and environments inspired Marwa Lamlum and gave her the ability to blend her knowledge together to create outfits that seal the gap between fashion and modesty. All of their pieces are handmade warranting a distinguished look that is both luxurious and glamorous. Roddiva Couture also took part in London Modest Fashion Week. You can find the collection in Limassol – for any information you can contact their Business Manager Sofi Zeniou at +357 99090994. 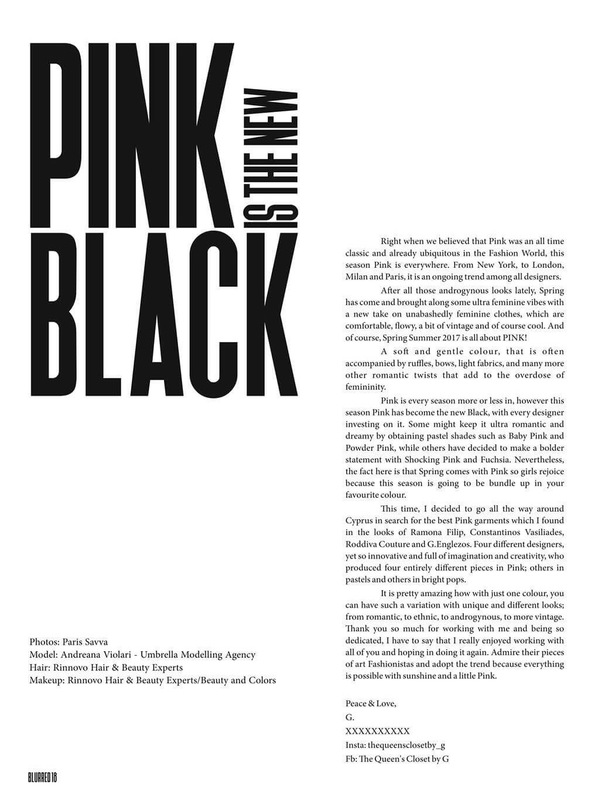 Gregory Englezos was one of the designers that introduced Pink before Spring, by designing a collection named ‘Think Pink’ with main elements being the chiffon, ruffles and cotton. It is pretty obvious that he has been majorly influenced by the good old times and the theatre, as he managed to take us there with his Pink dress. A beautiful gown in Pink, with ruffles on the bust and bell sleeves. I love how it defines the waist and then falls so romantically towards the ground and I admire how he managed to insert all those current trends on to a one single item that takes us back in time, yet still being so fashionable and chic. Gregory Englezos (G.Englezos) studied Fashion Design in Thessaloniki and later took part in fashion seminars in London and Munich. He also worked as a tutor at the Institute of Fashion in Cyprus and now he runs his own atelier in Larnaca and has dressed many famous and important women all over Cyprus , Greece and abroad. His collections can be found at MONOENA Boutique – Larnaca, at Karaoli & Demetriou street. You can also find them online at http://www.monoena-genglezos.com and on Facebook as MONOENA.